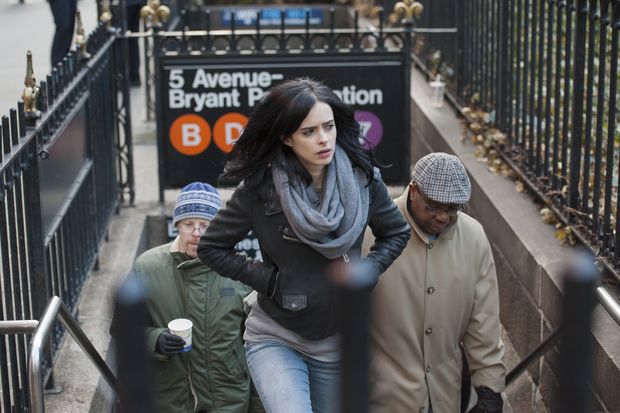 After a tragic accident leaves a superhero scarred, Jessica Jones turns in her cape for a desk job. Jessica Jones is a superhero who appears in comic books published by Marvel Comics, and now in the Netflix original series Marvel’s Jessica Jones. Jones is played by actress Krysten Ritter, from notable NYC films such as What Happens in Vegas and 27 Dresses, and she was nominated for Best Actress in a Drama series by Critics’ Choice Awards for her portrayal of the hero in the first season. The show first premiered in 2015 and currently has two seasons. Many of the locations from Jessica Jones can be seen on The Super Tour of NYC! Jones is a superhero turned entrepreneur. After a terrible accident occurs, Jones decides to follow a different career path. She starts a small investigation company based in New York City known as Alias Private Investigations where she is the sole employee. The company serves as a way for Jones to continue to help people, without having to throw herself directly into harm’s way, that harm being a very evil and manipulative villain by the name of Kilgrave (David Tenant). While attempting to move pass her traumatic history, Jones is constantly dragged back due to her PTSD. Along with Luke Cage, Iron Fist, The Defenders, and the other Marvel series on Netflix, this series has a darker tone than the films, but is definitely worth seeing. Obviously this New York based show has many filming locations in, you guessed it, New York City itself. Filming of the show took place all over New York, including Brooklyn, Queens and Long Island. In the second season, a pizza shop owner hires Jessica to investigate her boyfriend at Pomodoro Ristorante & Pizzeria on Spring Street. The shop has been open since 1985 and is known for there Vodka Pizza, which they believe is the best in NY. Notable celebrities such as Alyson Hannigan, have been spotted at the Pizza shop. A more notable location is Central Park. During episode 12 of season one titled AKA Take a Bloody Number, Jessica follows a man, who is believed to be under mind control, through Central Park. They pass by notable sights like The Mall, the Bethesda fountain, the Bethesda terrace arches and more. All of these sights can visited in our Central Park Walking Tour. Central Park is a beautiful and almost completely man made park located in the center of Manhattan. The scenery and architecture of the park is unmatched. It continues to be one of the most visited locations in New York City, spanning 843 acres from 5th avenue to 8th avenue and from 59th street to 110th street.